The Base Leg Blog: Singapore looking to replace KC-135s, would it acquire more than 4? Singapore looking to replace KC-135s, would it acquire more than 4? The Republic of Singapore Air Force (RSAF) currently operates four Boeing KC-135R Stratotankers with 112 Sqn from Changi West Airbase. All four aircraft were former US Air Force KC-135As pulled out from storage in the late 1990s and upgraded to KC-135R standard with new turbofans, avionics, a glass cockpit and a pair of Sargent-Fletcher Mk.32 (now known as the Cobham 500/700-series) refueling pods on the wings to refuel probe-equipped aircraft in addition to the fuselage mounted boom to refuel receptacle-equipped aircraft. The oldest of the RSAF's KC-135s was built in 1959, with the newest built in 1963 which would make the fleet ripe for replacement in the timeframe stated in the article. However, what Aviationweek did not mention specifically was the number of tankers the RSAF was looking to acquire, for in addition to the KC-135s, the RSAF also operates a fleet of ten Lockheed C-130B/H Hercules transports with Paya Lebar-based 122 Sqn, most, if not all* of which are capable of mounting a pair of Cobham 48" series wing-mounted refueling pods. Furthermore, since the introduction of the KC-130s in the 1980s and the KC-135s in 1998, the RSAF's force structure has undergone a radical change. Gone from the RSAF's combat orbat are the McDonnell-Douglas A-4SU Super Skyhawks, with the locally-upgraded Northrop F-5S/T Tiger II soon to follow. In their place are 60 Lockheed-Martin F-16C/D Fighting Falcons and 24 Boeing F-15SG Strike Eagles, and it is widely expected that Singapore will be a future customer for the Lockheed-Martin F-35 Lightning II Joint Strike Fighter. RSAF C-130H 731 in tanker configuration. Most, if not all of the RSAF's ten-strong C-130 fleet can be configured as tankers. What this means is that when the F-5S/T retires, the RSAF's current (and possibly future) combat fleet will comprise exclusively of aircraft which utilise the boom-and-receptacle method of inflight refueling. This would render obsolete the C-130's tanker capabilities in the RSAF (even if its transport capabilities are very much still in demand), and with US-based RSAF F-15 and F-16 training detachments needing (occasional?) support, along with frequent participation in multinational and unilateral exercises overseas**, there will almost certainly be a shortfall in the RSAF's refueling capacity, if there isn't already. So where does this lead? I would speculate that the RSAF will acquire more than four new tankers, replacing the KC-135s and KC-130s at the same time. It is not expected that the KC-130s will be replaced on a 1-for-1 basis, given the costs involved and the disparity in capabilities of the possible contenders over the KC-130. 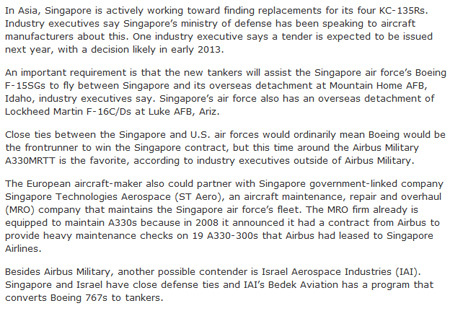 With all of that in mind, I would, however, be very surprised if the RSAF's tender for new tankers, which Aviationweek expects to be issued as early as next year with selection in early 2013, would be for less than 6 aircraft, with even 8 aircraft being a possibility. * - It is commonly mistakenly reported that only five of the RSAF's C-130s (four C-130Bs and one C-130H) can be configured as tankers. ** - Singapore-based RSAF jets deploy frequently to Australia, France, India, Indonesia and Thailand for exercises, with flights to and from the first three-named countries definitely requiring tanker support for F-15/F-16s to reach when flying from Singapore.